Below are common attributes associated to Hime Shojo Japanese Maple. Become a care taker for Hime Shojo Japanese Maple! Below are member comments regarding how to plant Hime Shojo Japanese Maple. No comments have been posted regarding how to plant Hime Shojo Japanese Maple. Be the first! Do you know how to plant Hime Shojo Japanese Maple? Below are member comments regarding how to prune Hime Shojo Japanese Maple. No comments have been posted regarding how to prune Hime Shojo Japanese Maple. Be the first! Do you know how to prune Hime Shojo Japanese Maple? Below are member comments regarding how to fertilize Hime Shojo Japanese Maple. No comments have been posted regarding how to fertilize Hime Shojo Japanese Maple. Be the first! Do you know how to fertlize and water Hime Shojo Japanese Maple? Below are member comments regarding how to deal with Hime Shojo Japanese Maple's pests and problems. No comments have been posted regarding how to deal with Hime Shojo Japanese Maple's pests and problems. Be the first! Do you know how to deal with pests and problems with Hime Shojo Japanese Maple? Looking for Hime Shojo Japanese Maple? Get Hime Shojo Japanese Maple fresh and large directly from the grower to your garden! Buy Hime Shojo Japanese Maple online from the nursery wholesalers and save BIG! Plant the Hime Shojo Japanese maple in sites that provide most any type of soil, but it must be well-drained! Wet soggy soil around the roots is a killer. It can grow in a wide range of soil pH preferring a slightly acidic soil and prefers partial shade in hotter climates. Japanese maples will grow in sun or shade but, in the deep South, most varieties benefit from some afternoon shade. In their natural habitat, Japanese maples are understory trees, growing in dappled forest sunlight and at the edges of woodlands. Ideally they prefer to be grown in similar conditions. Bright sunlight and hot summers do not kill trees, but in hot summer areas, the newest leaves may burn and scald when exposed to full, all-day sun. In the deep South, where the sun is stronger during summer, they benefit from some afternoon shade. Japanese maples are not heavy feeders however will benefit from fertilization. I fertilize my Japanese maples after new growth has emerged in spring with a slow-release, well-balanced shrub & tree type fertilizer. Alternatively, you can use a mild organic or natural fertilizer. For younger trees, a light 1 to 2 inch layer of cured shredded wood mulch or some other type of organic mulch is recommended to help retain moisture during the hotter summer months. Insect Problems - With the exception of the Japanese beetle, which causes very little if any damage, Japanese maples are not prone to insect problems. If you feel that you must spray for Japanese beetles or any other insects do so using a light mix of Liquid Sevin spray. Spray early in the morning to allow solution to dry on leaves before the sun is too high. Disease Problems - Provided soil is well-drained and the plant is properly irrigated, Japanese maples are not prone to disease problems. Consistently wet or soggy soil can cause serious problems with the roots. 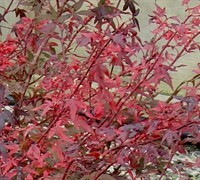 Always plant Japanese maples in sites that provide well-drained soil.